Going to a restaurant can be fun. Someone else does the cooking—and the dishes—which allows you to relax and give your child your full attention. Your child gets to choose her own meal, which means she is more likely to eat. You probably relax the rules about her choices, too. All of these factors should make for a happy experience. But it doesn’t always turn out that way. Let your child see the children’s menu before you enter the restau­rant. This way you can be certain the restaurant has some­thing your child likes. Give her plenty of time to look at the menu. If she can’t read, tell her the choices and ask what appeals to her. Explain to your child that the food may be served differently than at home. Advanced warning will help your child accept a food presentation she has not experienced before. If there isn’t a children’s menu, check whether child-sized por­tions are served. Most restaurants provide children’s meals. If not, ask for an extra plate so that you can give your child some of your own meal. Ask the waiter how your child’s meal will be presented. If the sight of tomatoes completely kills your child’s appetite, when you place your child’s order request that tomatoes be left off her plate. 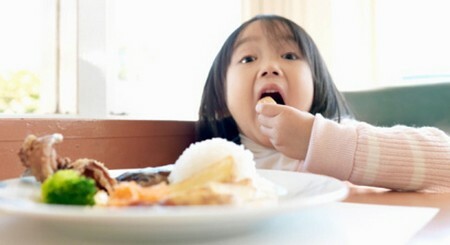 Don’t expect your child to behave perfectly, or to eat every­thing she ordered. Eating out is a thrill for a young child, and she may accidentally spill her drink or drop her fork on the floor. Ironically, excitement may also deaden her appetite. If so, ignore her lack of appetite and enjoy her enjoyment.